Thunderstorms and rain all day were in today's forecast, so I planned to spend the day indoors quilting. The thunder never materialized (if you can say that about a sound), but it was raining for much of the day, so I was happy to have indoor projects to keep me busy. I probably should have kept working on the Carousel quilt we laid out in the yard last week (I have two rows assembled so far), but I was eager to get started on a quilt I'm making for a friend of my husband. She's moving to Pasadena, CA this summer and I want her to have something to remind her of her friends back in Brooklyn. I lived in Pasadena for four years, and some of my closest friends are still there, so it has a special place in my heart. One of my favorite things to do each winter was volunteering to help build floats for the Tournament of Roses Parade. It's great fun working with all of the other volunteers, and it's amazing to see what the designers are able to come up with every year. Keep in mind that every surface on the float has to be covered by organic material, so these are not floats that can be thrown together overnight. 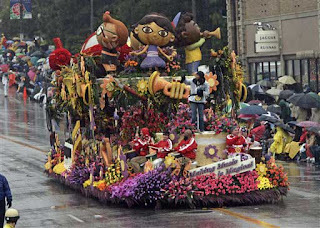 2006 NAMM float. I think this is the second (or third) float I worked on. Anyway, because of the parade, and the many roses that grow around Pasadena, I wanted to include roses in the quilt somehow. Her favorite color is "any shade of purple," so I set out to find a fabric that featured purple roses. I decided to try to find a large print to use in the Lake Shore Drive quilt in Colorful Quilts for Fabric Lovers by Amy Walsh and Janine Burke. It uses wide strips of the focus fabric with pieced strips of scraps dividing them. I'd been admiring the pattern for a while, so I'm pleased to have a project suited to it. I found a few purple rose fabrics online, but nothing seemed right for this extraordinary woman, who had a successful career as a clothing designer, later sharing her knowledge and experience as an author. I concluded I needed to see fabrics in person to decide what would make this quilt pop. 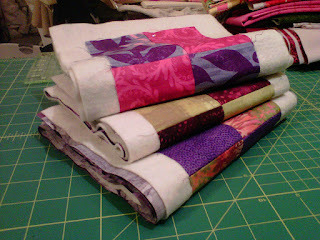 I headed over to the always wonderful City Quilter. 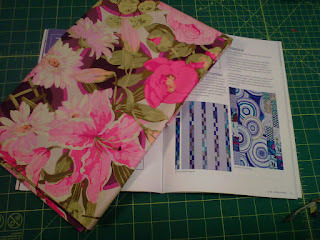 After looking at several Kaffe Fassett fabrics and some other large prints, I settled on Flower Market by Martha Negley. The photo I took shows lilies, daisies, and peonies, but I swear it also has roses. The fabric has a lot of pinks, but there is also a good amount of purple. 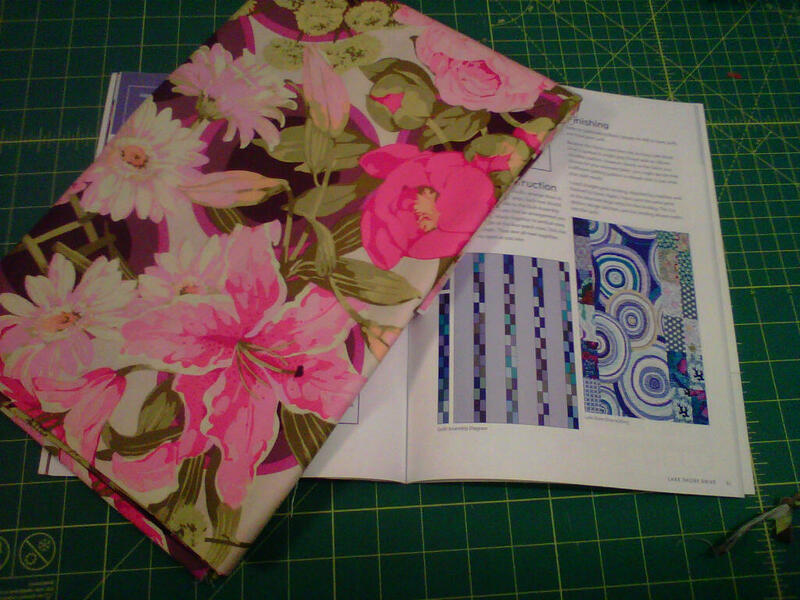 Flower Market by Martha Negley, with pattern page for Lake Shore Drive quilt . 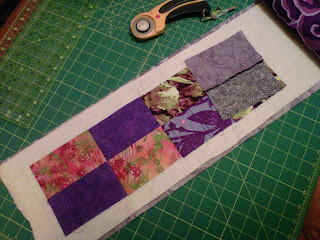 I got all of the rectangles cut for the pieced strips and laid them out on the bed to make a pleasing pattern. (I'm making a lap quilt, so I didn't have to drag anything outside in the rain.) 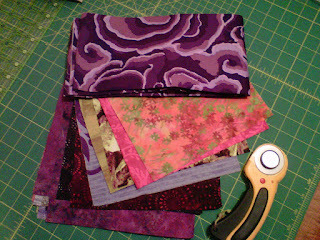 I'm doing it as quilt-as-you-go, so my next step was to cut strips of both the Wood Ear (for the back) and the batting. I sewed together two of the rectangles in each small four-patch before sewing them onto the batting and back. The strips came together quickly, so I was able to get three of the four done before dinner called me away.